Lefebvre's Upholstery: My Furniture is Stuffed with WHAT? Is it possible to determine the age of a chair by it's seat filling? I bought a chair that is filled with a combination of cotton batting and horse or hog hair. I assumed it wasn't an old chair because it is covered in vinyl - not real leather. It's quality vinyl - but vinyl all the same. It needs re-stuffing and I would prefer a fabric seat but I don't want to ruin a quality piece of furniture with my DIY upholstering! Hello Jill, It's difficult to date a chair simply by its stuffing, because very old chairs can have new stuffing (if the old was replaced), and likewise, newer chairs could be re-stuffed with new traditional stuffing (this is far less common). From your description, it sounds like you have a fairly old chair (a photo would help). 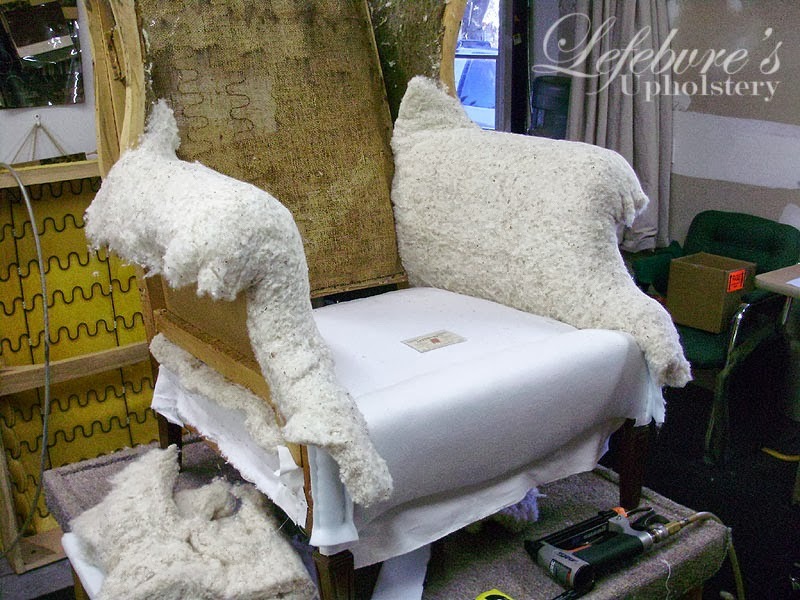 The chair can be reupholstered in fabric without changing the original stuffing, just be sure to discuss this with your upholsterer (I'm not sure where you're located, but if you're nearby we'd be happy to help you with this project). Visit http://lefebvresupholstery.com/site/ for more details. 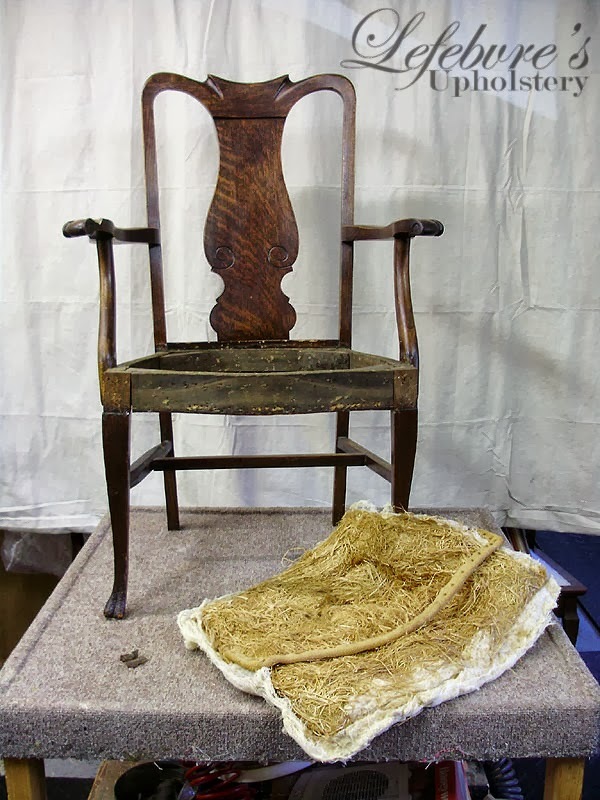 I am trying to determine the age of a chair that I believe has moss and straw under cotton. It had claw feet but a low back. I thought it was a Bishop Chair but because of the low back I am not sure. I don't think it is horse hair because it has like a plant feel to the hairs. Help?? 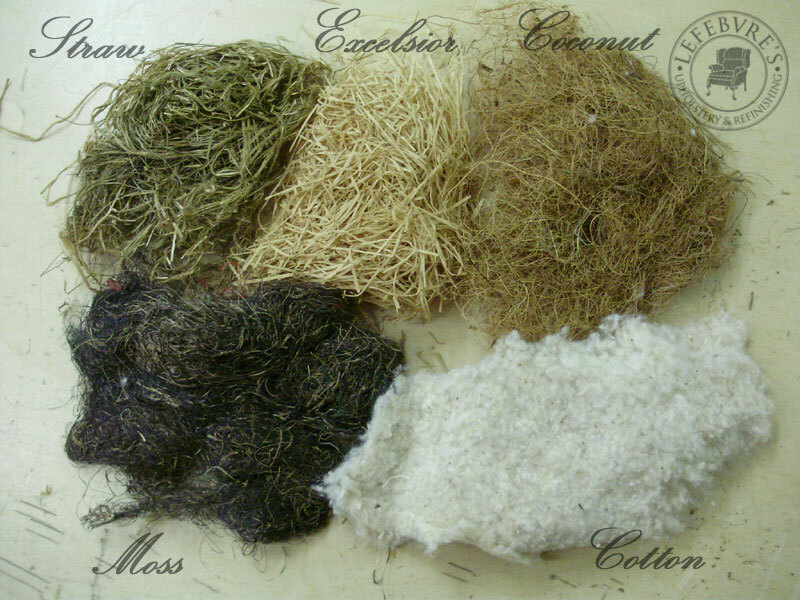 Hello, moss and straw under cotton is very common on older pieces, and it was used for a long period of time. It's very difficult to date a piece just by the stuffing materials. It's usually easier to estimate a date when looking at the entire piece. What kinds of springs were used, the type of wood and joinery in the frame, the overall shape of the piece, etc. I purchased an old chair at a thrift store recently for $7! I am trying my hand at reupholstering. During my research I found the EXACT chair on a blog that stated it was from the 19th century. I have removed the fabric. It looks like the original fabric was covered up when it was last reupholstered. The stuffing material looks like cotton batting and curly horse hair. The seat/back are actually stuffed channels and then stapled on to frame. I was planning on making it one solid piece with out channels (not using any of the current stuffing materials of fabric). Any suggestions or comments would be greatly appreciated! I have a child's platform rocker with padded seats, arms and back. I believe the stuffing is cotton and straw. Can I send a pic? I would love to know it's age and anything else you can tell me. What would it sell for (in case I go that route). Hi I'm doing some research for a project, was wondering if you could tell me what stuffing was most common in upscale 19th century furniture please? In particular in chairs, any help would be greatly appreciated. Hello Bethan, It depends on the company, and on the quality of the piece. If you're talking about only high-end pieces, the larger upholstered items tend to have mainly moss (as the base), black horse hair (middle layer), and cotton over the top (top layer). For an example of this, you can take a quick look at "Wonderful Antique Sofa - Bold Orange & Dark Navy Print" (March 2 2014), however, the padding wasn't really shown in the photos. On even higher quality pieces, the stuffing can be entirely horse hair, with cotton over the top. When you mention "chairs" it's harder to give you an answer without knowing exactly what type of chair you mean. 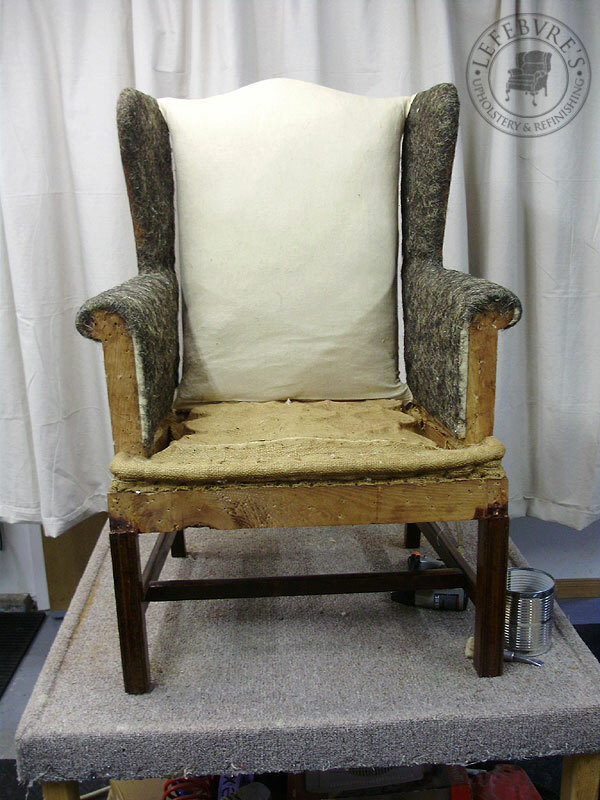 A high quality Victorian arm chair with a tufted back would have the same kind of treatment (moss or straw, hair, & cotton), with mostly hair used on the back. For an example check out the seat on "Antique Arm Chair - Light Blue (Project of the Month July 2014) " (Jan 3 2015). If you mean something like a plain dining room chair with a flat seat, then it may just be a thin layer of straw, with a good amount of cotton over it, and nothing else. 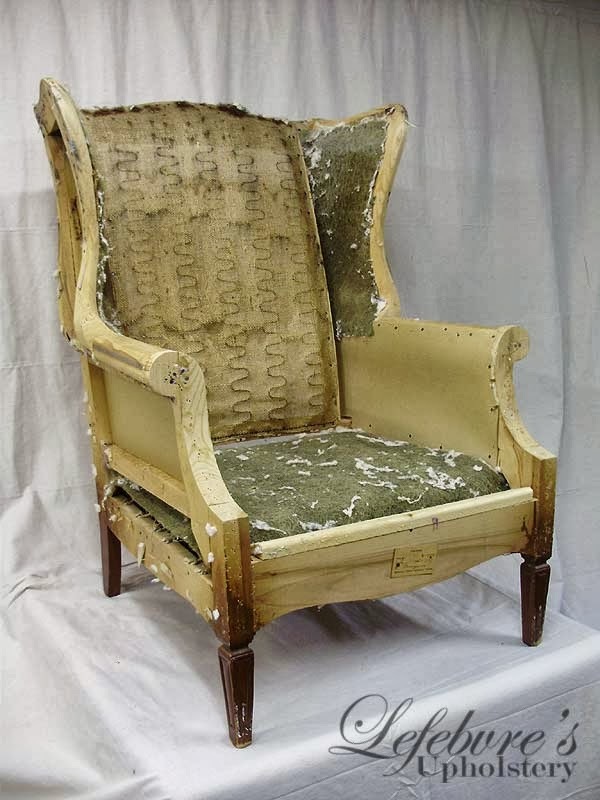 On something like a Chippendale upholstered dining room chair (with a square seat), it would have a double stuffed seat: webbing, a base of either straw or curled hair, hand stitching (to form an edge roll), a second stuffing layer (more hair or straw), followed by cotton, a rough cover, and the finish fabric. The treatment would be nearly identical to the chair in the link above. Hope this helps. Thanks so much, your knowledge is impressive! Sorry, I should have been more specific about the chair, but never the less, your answer has really helped. Any possibility of dating a chair if I email or send you a picture? I have an old divan with horsehair on it I would like to reupholster it with the same material, how much in kilograms I will need for the following measurements: base w140cm by h65cm and the back support w50cm by h65cm? Hi Sara, I'm not exactly sure how to help you with your sofa. If it already has horsehair on it, then you should definitely keep it and reuse it. We never replace horsehair unless our client specifically wants it removed. We also don't carry horsehair, so I've never had to estimate how much to use for a particular piece. Horsehair is very expensive (about 30-40$ per pound), and for a whole new piece, it could easily cost about 1000$ in new hair. This all depends on the style of the piece, and how much hair is used in the stuffing and foundation. Even if I had a photo of your sofa, I'd only be guessing. I purchased a small bench from Habitat Restore that has a seat with burlap straps holding in horsehair filling. The cotton on top had disintegrated. I am wondering about simply replacing the horsehair and cotton, but would I devalue the piece? The bench is wonderfully crafted and obliviously a quality piece. Thank you for your expertise! I have a sofa , purchased at a used store, for $100. It has horse hair cushions, but the fabric is parcially redone. I wondered when it was first made. It has beautiful cut out walnut wood as a frame. If I sold it, & it is in good condition,how much can I charge for it? There's a fairly steep learning curve when working on antique pieces. Learning to tie springs, applying burlap, and hand-stitching can all be challenging. It can definitely be done, but I would suggest watching several online video tutorials. The stuffing may itch simply because it's releasing a lot of fine dust. Try to have ventilation, or if possible, wait until the spring/summer and work on it outdoors (in the parking lot or on the balcony) at least for just the base stuffing and rough covers. Sorry for the late response. Hi JC- Very informative blog so I hope you can help me. I tried re-cover an antique pianola stool but there were so many tacks and nails in it that there was no room for any more. So I took the previous cover off and found 3 more covers underneath and also the original stuffing. I am not sure what it is made of. It is brown and quite hard but very dusty and crumbly and I don't think I can re-use it. Is it ok to replace it with HD foam before putting on the new cover? It's very common to find stools and small chairs where the upholstery has been layered on like an onion, instead of having it removed and upholstered correctly. All the old tacks and staples, and all the previous covers need to be removed. From your description I am not too sure what the stuffing material was. It sounds like it could be a type of felt/cotton blend. We sometimes keep this if it's still in decent shape, and we'll add fresh cotton to it, OR we replace it with a foam. I live in Germany and recently had a neighbor set an old chair out by his garbage. I quickly ran over and grabbed it with the hopes of reupholstering it. The neighbor stopped by and said the chair had been sitting in his shed for ages and he had gotten it from an old man, so it could potentially be very old. Today I started to take the fabric off, and found it was filled with straw or hay or something. It also has metal springs inside the back and a metal type of wiring underneath. Is there any way I can send you pictures of the chair to get a little more information? This chair is very unique looking and my mom and I have never seen anything like it! You can try sending photos to myself or Pierre. I've added a note at the bottom of the original post. My daughter recently purchased a french provincial three piece sofa. The tag says Body rubberized hair pad. Horse Hair 15 percent; Hogs hair 85 percent; shredded latex foam rubber 20 percent, blended cotton felt 50 percent. We are just trying to figure out when this piece may have been made. The tag says New York in several places, but with the exception of where it states the furniture is in compliance with certain acts dated 1923, 1926 and 1929, there is no other identifying names or years. Any ideas? Normally when there are tags with several dates, you can somewhat safely assume that the piece was made within a few years after the most recent date. If the last date on your sofa is 1929, I'd say that it was likely made in the early 1930s. There are of course exceptions, and without a photo, this is the best info I can provide. The fact that is says rubberized hair makes me think it could be slightly later. I just purchase a loveseat that appears to be very old. It very dark wood and the cloth is somewhat a large paisley print. It is padded with what appears to be coconut fiber and it has springs that are connected to a metal bar underneath. I was wondering if you could tell approximately the age of it. It's impossible to estimate any kind of date without a photo. Hi Mz. Whitney, it looks as though you already have a pretty good idea of the date from your research (1903-1920). A date of around 1910-1920 seems perfectly within range based on the wood used, and the style. The leather seats with thin padding (probably excelsior) over a feathered-edge plywood (or solid board) is typical of the early 1900s. These sometimes have just a thin layer of felt or cotton instead. The padding can be added-to (with something like cotton) or a newer foam can be used. The set looks quite nice, but it isn't a valuable antique, so stripping and refinishing it shouldn't be a problem. I'd suggest sticking with leather or black vinyl to match the period style, but any decent fabric would also look nice. What a beautiful find! You have an old settee, which was probably once part of a set (there is usually a plain chair and a rocking chair in the same style). It is Eastlake style, and in walnut, and it probably dates to around 1880-1890. Would it be possible to add a link on my website to this article about stuffing? Thank you so much for offering your opinions to people like me who are seeking information about the age or potential history of their pieces. The Morris chair is a family piece that I think dates around the late 1890’s. This is based on other furniture it spent its life with and newspapers found stuffed in those other pieces. The Morris is stuffed with cotton as near as I can tell and the original leather was too far gone to save. The tufted chair is stuffed with cotton and I think horse hair. I was told it is pushing 200 years in age but this sounds a bit unbelievable to me. Kyle, your link doesn't work. I tested the one below. Should work now. The tufted chair is harder to date without seeing the interior construction and the way it's sewn (inside), the kinds of springs, etc. It could be as old as the 1840s, but also as late as around 1890. It's a nice quality piece. I think it probably had casters. Thank you so much. I appreciate your expertise! Could I have your opinion on a set of used dining chairs I just bought? I was taking them apart to reupholster (the seats were sinking) when I got a surprise. The inside was stuffed with what my mother tells me is horsehair, covered by muslin (machine sewn) and cotton batting. Instead of a board for support, there is some kind of webbing. I've attached a link with pictures. https://www.facebook.com/deborah.spier/media_set?set=a.1947948858556383.1073741828.100000238634579&type=3&uploaded=4. Any idea of how old they are? I don't want to damage their value but I need them to be usable for my dining room. I'd appreciate any information you could give me. Thank you. Hi Deborah, You have a very nice set of antique chairs. I don't think they are genuine Chippendale chairs from the 1780s, but they look very well made, and I think they might be from around 1900. Even if they were much older, reupholstering the seat doesn't normally affect the value. I would just stretch some new webbing, reinstall the horse hair, the cotton, and your new fabric. Thank you so much! I also meant to ask if you can tell the wood. The seller told me she thought they were either cherry or mahogany but didn't have any info on them. Is there a way to tell? When you say reupholstering probably wouldn't affect the value does that include replacing the stuffing? I hate to sound crass but the horsehair is very uncomfortable and crunches when you sit on it. Well, removing the horsehair (in my opinion) would definitely hurt the value. 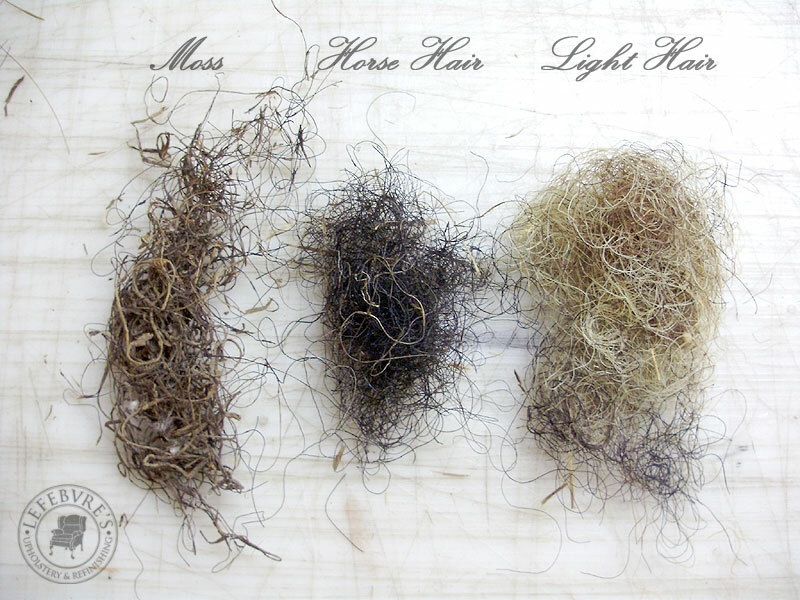 Horsehair is extremely expensive, and lasts for centuries. That said, they are your chairs, and you can have high quality foam pun in them if you wish, but I would suggest padding them with additional cotton batting over the original horsehair instead. You can add as much of the cotton as you want (an inch or two, even). Alternatively you could add a thin layer of foam over the horsehair. As for the wood, it's too hard to tell from the photos what wood was used. It certainly could be cherry or mahogany, but it could also be deeply stained birch or maple (though that's less likely). I don't see much visible grain pattern so it's really inconclusive. I'd need a close-up to give you a better idea. The horse hair that I removed from my 100 year old dining room chairs was in bad shape. I have redone the jute web and have found a rubberized horsehair online. I am trying to decide if I should use that or foam, and should it be 1 or 2 inch. If foam, is the "high density" that is sold in fabric stores supportive enough? Thanks for your advice! Hi, please forgive me for additional enquiry amongst the already long list posted on this site. A wingback chair has just been acquired by myself as a first time project for restoration. However, other than websites and YouTube, my inexperience and lack of knowledge in this craft sought me seeking some advice or guidance on tackling this as a first time restoration project. Thus my decision to restore the chair, the leather fabric and filling, with mostly cheaper materials such as faux leather seems to me a sensible alternative to learn from. Any thoughts or knowledge, both for and against, on this idea will be greatly appreciated. Ideally, the best would be the best, but my inexperience with a finite financial resource allows more towards practicality. Many thanks already for this website full of knowledge. I love the information in your blog. I have just finished a chair that is approx 100 years old with the help of an upholsterer from a community education class. It has been a grand learning experience. I had straw that he had me fluff and put back on. We added coconut fiber and did a light sanding of the wood. I wanted to keep its rustic charm. I am currently redoing two cushions from another chair that was given to me - it has a marshal unit in the back cushion and a wire box spring unit in the seat. I love putting stuff back the way it was.... straw and springs. Trying to stay away from the foam. Love the art ....Thank you. Dining table in American walnut Find the best modern solid wood dining table in American walnut @ londonbrothersgates.co.uk. We are the large collection of furniture handcrafted by professional craftsmen. Upholstery utilized for enriching the home. I have a two seater love seat which was talented by my companion when I move in my new home however now as it goes old, its spring goes out and it additionally get grimy. So I m simply searching for an upholstery cleaner in then all of a sudden I viewed. I contracted them and inside 2 hr their specialists come at work place and treat my couch. Presently my couch looks extremely excellent and new. Much thanks to you Upholstery Cleaning Melbourne For giving me this sort of brilliant service. If you wish to get your Fresh Upholstery Cleaning Melbourne cleaned by professionals then Upholstery Cleaning Melbourne is the answer for you. We have been their loyal customers for a while now. 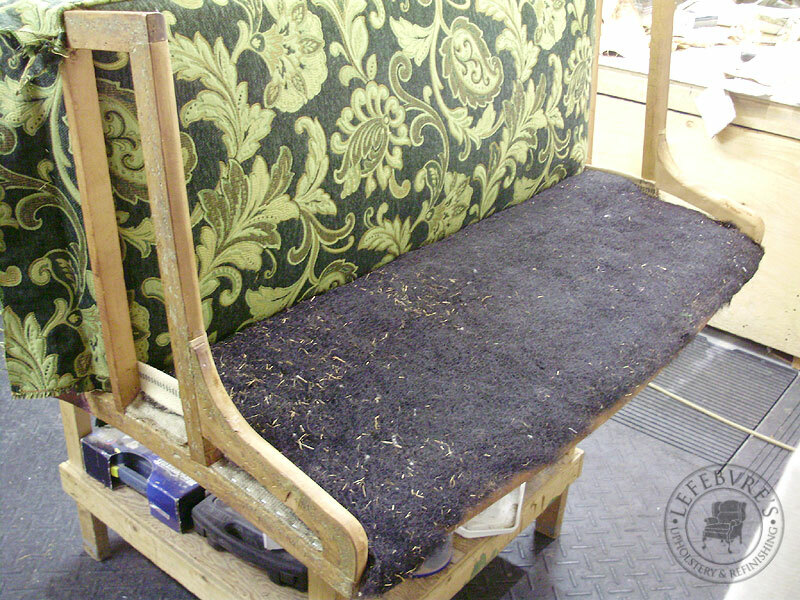 Every time we call them for Fresh Upholstery Cleaning Melbourne, our upholstery gets a new life. The best part is that they deliver chemical free upholstery cleaning which ensures that we don’t add to carbon content to the environment. Thank you for a nice service. I am sharing my experience with Fresh Mattress Cleaning. On the suggestion of a friend, I got an appointment for Professional Mattress Cleaners in Melbourne and mattress sanitizing. I have to say that these guys are professionals and reliable. Moreover, they ask for a genuine price that does not sound too cheap or too lofty. It is good to have found an affordable yet good mattress cleaner in Melbourne. I have a vanity seat that had the brand name fitsus tag w/ I believe black horse hair any ideas? Hi there! I have a chair that I’m working on and I’ve discovered a layer of stuffing that I can’t identify. 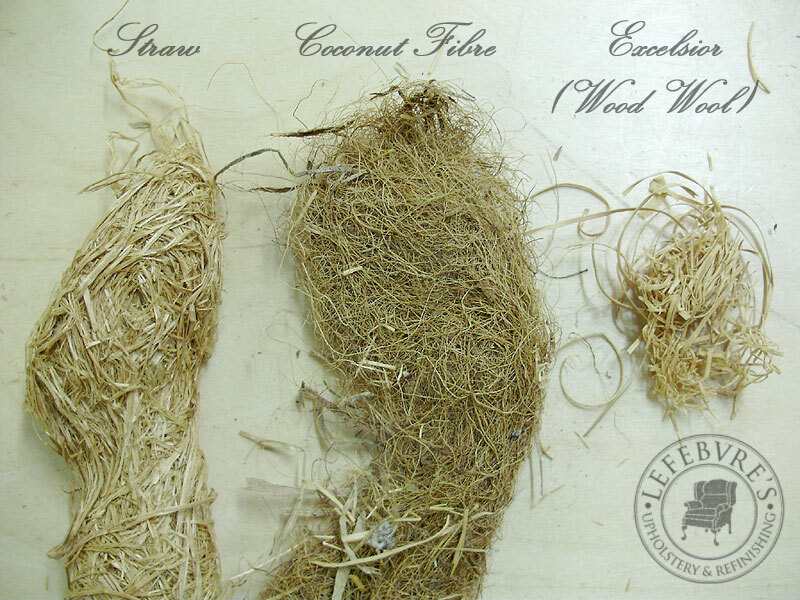 The bottom is a plastic mesh, the next layer appears to be coconut fiber or hog hair, and the top layer is cotton. But the middle layer is very strange. It’s green, and there is a layer of fine green dust on the frame under it. What could this be? Please tell me I’m not looking at some form of arsenic or chemical fire retardant. Actually, please tell me if is so I can protect myself accordingly! Thanks! It's impossible to tell without a photo. It could be green coloured foam, green tinted rubberized hair, some kind of coloured felt, etc. If the chair is old, I would doubt that it has anything fire retardant in it, or dangerous, but again... impossible to tell without a photo or a better description. Here's a link to a blog post with pics. I think it's rubberized hair... but would LOVE your input! Hi Lauren, I had a look, and it definitely looks like a regular pad of rubberized horse hair. I believe the green dust is the rubber coating on the hair starting to fail after a few decades. As for whether or not it contains any fire retardants or harsh chemicals, that I can't say for sure. You can definitely take it out side, beat the rest of the dust and powder out of the pad and re-use it. If you're very worried, you can replace it with new horse hair (hand-bunched in place to form a new pad, or as a pre-purchased pad). Alternatively a layer of foam the same dimensions could be used there. I would keep the original stuff, but it's entirely up to you. Thanks JC. I feel pretty comfortable with it, now that I think I know what it is. I was actually pretty impressed with the quality of the stuffing, so I really want to use it. Thanks for weighing in!